Today on my podcast, one of our wonderful callers Annette shared with us that although her son is talking now and understands and says, “Dada,” he’s not yet saying “Mama.” How heartbreaking for her! On our show today, we gave Annette a couple of different ways to work on how to help him learn to call her Mama, but before we get into that, let’s review what could be going on. (Let me say that I didn’t explore all of these with Annette on air, and I haven’t had the pleasure of meeting her cute little boy, so I don’t know with any certainty why her particular son isn’t doing this yet.) However, it is not uncommon for children with language delays to struggle with learning to say “Mama” for several different reasons. I’m going to discuss the possibilities of why he’s not doing it yet, and hopefully give you some ideas so that you can work on these at home with your child who may not yet be saying this wonderful word. Possibility #1 -Conceptually the child has not made the connection between this particular word and his actual mother. Sometimes it’s because this word has not been presented to him in the same way that he learns all of his other words. Since his mother is likely doing most of the teaching, it’s hard for her to label herself in a way that makes sense to him. When she’s teaching him names for other things, she’s repeating the word many times, holding up the object, or pointing to it so he gets what she’s talking about. She may even have him “ask” for it so that she knows he’s made the connection between the word and the actual object or event. This is kinda’ hard to do with yourself! Even though a mother is likely saying “mama” in context all day long (“Give it to Mama.” “Do you want Mama?” “Where’s Mama – Here I am!”), it’s just not the same for him as when his primary language labeler says it, shows it, and does it in the way that she teaches everything else. Solution – Use very specific activities to teach him to conceptualize or learn this as your label/name. Ideas you can try at home. Just like you’ve tried to teach him “Dada” or any other name by constantly labeling that person, you’re going to have to get someone to play with you to label you as “Mama” and then you’re going to have to reinforce him using “Mama” in the most powerful way you can. The most success I’ve had with this is by placing the child in a confined area, say the crib, or behind a gate, or in a room with a closed door and me. Mom hides outside the room, behind the door, or bends down below the crib so that the child can’t see her. Then I model calling, “Mama. Mama. Maaaaaaamaaaaaaaaa” several times using an exaggerated, playful, and animated tone of voice.I can’t stress how FUN and ‘over the top’ you need to be when you’re playing this game. Coach the other person to increase their affect if they’re not being as excited as they should be. Cup your hands on either side of your mouth too so that a child attends to your mouth and the act of “calling.” Sometimes we’ll see a child begin to copy that action before we actually hear the word and that’s great progress! He understands what you’re doing and this tells you the game is working and to keep practicing! After calling for mom in this way several times, Mama excitedly jumps out from her hiding place with a big smile and shouts,”Mama! Here’s Mama! Mama!” We all laugh and smile and hug and tickle so that it’s very clear that this is a fun game that we all want to play again. Then we play it again. And again. And again, until I think he’s ready to begin to try to imitate “Mama” when I model this. If he even hints that he’s trying to say this on his own, I ask Mom to pop up with the biggest reaction she can muster so that he links his action (saying the word) with her return. Older siblings are GREAT at playing this game with mom and younger brothers and sisters. The act of having someone else “call” you and label you as “mama” sometimes helps a child solidfy this concept. If you have no other children, then have Dad, grandma, your sitter or even a neighbor come in to help you teach your child this fun game. Don’t try to do it alone. Having another person call you “mama” is what makes this game work. 2. Play the “name” game for everyone at home. I usually recommend that families do this at dinner or at another time when everyone in your family is seated and isn’t distracted. (Meaning no TV or other playful activity going on!) Start with the “name” your child most easily understands or says and ask, “Where’s ______?” Build up the anticipation by asking it several times. Hold your hands out and look around expectantly. Wait for your child to look at the person, point, say the name himself, or somehow indicate where the person is. Even if he doesn’t, have everyone else excitedly point, look, and shout the person’s name. Have the person named say their name, such as “Dada!” or “Sissy!” That person should also hold up their arms or clap or do something to indicate that he or she is the person named. Laugh, giggle, smile, hug, and make this a total riot for your toddler.Repeat it for every member of your family, but especially have someone else ask, “Where’s Mama!” so he doesn’t hear that label from you. Some kids learn almost everything they know visually, by seeing it, and not auditorily, just from hearing it. That’s what makes it so difficult for kids like this to learn language since language is an auditory communication system. These are the kids who like to look at pictures in books, and these are the kids who LOVE screens (like apps on your phone, a DVD, TV) and videos. Use this to your advantage. Solution – Teach him “Mama” in the way he learns. Get your husband, partner, boyfriend, a grandparent, an older sibling, your best friend, or ANYONE to come and shoot some footage of you in some very focused and specifc activities I’ll teach you below so your child can learn to label you as “Mama.” This has been a huge success every time I’ve used it. This is so easy now with smart phones! Try to shoot the beginning shots with as plain a background as possible. Try to look as “normal” as possible too. If you usually wear sweat pants and have your hair in a pony tail, don’t doll up for this movie. Your kid may not recognize you! Begin by standing right there in living color, looking right into the camera and saying “Mama.” Smile. Pause. Say “Mama” again. Wave. Say “Mama” again. Blow kisses or do any other action your child might associate with you. Say Mama in this way 5 or 6 different times with huge pauses in between so that your child can begin to imitate and say “mama” himself during these pauses. Then have your person behind the camera say it a few times in imitation of you, or after you say “Mama” again several times. This will help your child begin to imitate this word. After 4 or 5 rounds of saying “Mama” in this way with waving or blowing kisses or some other simple action your child will recognize this, turn the camera off and reposition yourself behind a door or couch or counter. Then have the person who is videoing you turn the camera back on focused on your hiding place. Have that person ask, “Where’s Mama? Where’s Mama? Mama! Mama?” Jump out from behind the obstacle in a very animated and playful way and say, “Mama” with as much warmth and excitement as you can muster. Again have your camera person say, “Mama! Here’s Mama! Mama!” Repeat this several different times in several different locations. Don’t forget to use pauses so that your child can being to imitate the word “mama” at the appropriate times. Sometimes families have added other statements such as, “There she is!” or “Hi Mama!” But I think it’s most effective to limit the word to “Mama” so that there’s no doubt what you want your child to learn to say. You can repeat this with other family members too. But again, if saying “Mama” is the goal, don’t make it more complicated than it needs to be! Once your child can do this, move on to the Mama games listed above in #1 or reenact some of your “hiding” places from the video in real-life too. So if you’ve hidden behind the pantry door in your Mama video, when your child is in the kitchen, hide behind the pantry door and call yourself to play this game in real time. 2. Make a “Mama” album. If your child likes to scroll through your phone or the iPad, make an album of pictures you so that he sees you. The key is, you MUST scroll through the pictures with him saying, “Mama!” several times for each picture. He can’t just look at the pictures by himself – there’s no language with that activity! He must hear the word “Mama” as he sees the pictures to make this effective. You have to purposefully point too and label the pictures by saying “Mama” over and over again, not just 2 or 3 times. Get an older sibling or your sitter or Dad or other important people to repeat this activity with your child too. Try to use this activity during times when he wants your phone and doesn’t want to do other things such as when you’re waiting in line somewhere or anytime you’re sitting with him and can talk to him in the way I’ve recommended. For kids who love books, make your very own Mama photo album. Have someone take lots of current pictures of you. You’ll need new ones, not ones from 20 pounds ago, or when your hair was longer or blonder, or any other pre-mom photos since we all know how different you look now that you’re sleep-deprived and exhausted from chasing a toddler! It used to be really hard for moms to come up with several pictures since we are usually the ones behind the camera, but with the invention of “selfies” any mom can take your own picture right now with your phone! Take several new ones, and again in your “normal” everyday Mom attire. If someone else is taking the pictures for you, get close ups of your face with few background distractions. Not producing /m/ could be a sensory issue – Some kids don’t like the feeling of their lips being together to vibrate for /m/. These are the kids who may refuse lots of foods, hate having their faces washed, or flip out when you try to brush their teeth. They truly are HYPERSENSITIVE in and around their mouths or possibly all over their bodies. Then there’s the other extreme. HYPOSENSITIVE – These kids have so little awareness of their mouths that they don’t even know “how” to make an /m/ sound. Usually there are other indicators such as profuse drooling after age 2 since they don’t routinely close their mouths (usually mouth breathers from a sensory perspective OR because they have so many allergy/respiratory issues that they HAVE to mouth breathe!). This may be a kid who constantly places toys or other things in his mouth. Or it may be a kid who over-stuffs his mouth with food to the point that he gags. He lacks the normal sensations in his mouth. For whatever reason, he does not “feel” things normally in his little mouth. Not saying /m/ could also be a coordination, or motor planning and sound sequencing issue. He may even be able to use an /m/ sound alone, but not necessarily combined with the ‘a’ for Mama. Solution – Work on the /m/ sound. My favorite way to get this sound is by saying “mmm, mmm, mmm, mmm, mmm” with foods he loves. Exaggerate this sound! Shake your shoulders when you do it. Make it so silly and captivating that he’s going to want to try to imitate you. While earlier in my career I may have tried chapstick or lip gloss on your lips and then hers (or his!) and again exaggeratedly rubbing my lips together to increase sensory awareness of his lips, now we know that that’s more likely to promote tongue protrusion since the child will only want to lick that yummy stuff right off his lips! Some SLPs like vibrating toys or textured spoons, but I’ve even stopped doing all of this. You MAY even try helping him get his lips closed by placing your index finger above his top lip and your thumb below his bottom lip and helping him close his lips, but if he’s negative or over-reactive to this very hands-on approach, stop. Don’t overdo this method because then you’ll ruin it for the both of you! One little guy I have right now on my caseload is responding very well to the verbal cue, “Hide your lips” to produce an /m/ sound when he watches me model this sound. When a child can produce an “m” sound, or even if he can’t, keep modeling “mama” in speech often so he begins to imitate it, even if it’s not in context, or purposeful just yet. I hope these ideas help your child begin to say this magic word! Pretty soon I hope you’re hearing “Mama! Mama!” all the time. Then you have to promise NOT to complain when she says it so much that it makes you crazy, but that’s a whole different post!!! Watch the video with these tips. ← What Do You Do When NOTHING Is Working? I just wanted to give you a little update on the “mama” issue. I have been so busy around here, I just haven’t had the time to tell you about it. I still play a hiding under a blanket game and ask “Where’s Mommy?” Then jump out and say, “There she is!” I am working on asking questions (which he is getting so good at now) and also answering them… which is still a bit slow, but he does have some answers to a few. I love your site! You are my hero! I come here almost daily to get more familiar with ALL of your articles.. Yours is my most referred site to others I encounter with speech delayed children. I can’t wait for each new article you publish! I have some questions about Echolalia and will try to address those with you soon. I don’t think Jake has a problem per se, but I wonder at what degree does parroting become more like Echolalia? Thanks again! You are the greatest! Annette – Isn’t “Mama” the best word ever! So glad you’re hearing it from your little guy! Thanks again for the praise! Imitation (or parroting) is a part of normal language development. We do want to teach and see lots of imitation, especially in the immediate context such as situations when you are modeling what your child should say in a specific situation and then he imitates you. It becomes problematic when there are chunks of information imitated at a later time, especially when there appears to be no logical connection to the current situation, AND when the echolalic utterances aren’t eventually replaced by more spontaneous language. For some children, especially those who have demonstrated red flags for autism (with or without a formal diagnosis), this may take a while. It breaks my heart that my 17 month old just won’t do it. The worst part? I’ve tried all of the steps above and all he says is DADA. If I say, “Say mama.” He responds, with a smile, “Dada!” I know he doesn’t understand that this hurts me, but it does. Coupled with the fact that he runs to daddy when daddy asks him, but walks away when I do It makes me start to wonder, does my son not like me? I know these are foolish thoughts but I simply don’t know what else to do! Please help!! I’d also recommend that you really “up your fun factor” when you interact with him. Many times toddlers, and little boys in particular, seem to prefer to play with Daddy because Daddy really PLAYS! Dads notoriously roughhouse and are a bucket of fun when moms are more intimate and low-key. If this is the case, then be more animated when you’re playing with him. Chase him, tickle him, throw him up in the air, help him jump on the bed, swing him around in your arms, and perform all of those other tricks he loves with Daddy. Play, play, play if you’re not doing that already. If you’re not sure how to do this with and without toys, check out my DVD Teach Me To Talk. The clips alone should give you some ideas about how “fun” you should be when playing with him. Many babies say “dada” as their “default” word too, so it could be that he’s saying “dada” because it’s all he CAN say. Does he have other words? If not, then know that he’s not really Dad-obsessed, he just can’t say other consonants yet. That may not be consolation to you, but if you’ll think about it as he “can’t” say mama rather than he “won’t” say mama, it will probably help you feel better. hi my daughter is 9 mo old and she started saying ‘mama’ to everything at 8 1/2 mo but now she has learned ‘dada’ and that is all she will say. I feel like she forgot how to say mama, and im so disapionted! I keep saying ‘mama’ to her and she pointes at me and then just keeps doing whatever she was doing, is there anyway I can get her to say it again? I’m so sad I feel like she has forgot how to say ‘mama’. I came upon your website in a kind of a desperate situation.My 23 month old boy still does not speak.He babbles a lot,but is not pointing to anything and does not even call “mama” and “dada”.We are very worried.I know that he can point and can say words because he used to point to objects for a few days before and he used to say 2-3 words before,bubt not anymore.I spend hours teaching him to say a word,but he thinks it is fun and continue either laughing or babling in a happy manner.He just seems to me to be a too much of a happy-go-lucky kind of child.He seems very smart in all other activites and follows and understands almost all directions.PLease help. Suruchi – There are lots of articles here on the website for ideas with how to work with him at home. I’d also recommend that you check out my DVDs for ideas so you can SEE how to work with him to teach him those words you want to hear! I have an 18 month old daughter who still will not say Mama. We just made a video today and we are starting to play the Mama game. Any thoughts on how long these tricks usually take before I get to hear her finally say Mama? I have a 23 month old son who can’t say mamma either. He says about 30 words or so immitates sounds pretty good. When he first started to talk he would say maa maa but stopped. He always mmmms when he eats. 🙂 I did notice that he can’t really say moo. He says mboo. Sometimes he gets out moo but he has to pause a bit. I think he’s trying to call me abma. But it’s so hard to see if that’s the connection he’s making. I’m home with him all day. Any advice? Should I take him to speech therapy for his m’s? Lisa – I’d go ahead and get him evaluated in the next couple of months to rule out any huge issue for him if he doesn’t mature and begin to use words with /m/, especially “Mama.” The speech errors that you’re describing sound a little atypical in that he can say /m/ when he’s not using it in words. If he had more words, say closer to 50, and if he already spoke in short phrases, I’d be less concerned about him. The MINIMUM number of words we want a 24 month old to use is 50, and we also want them to use 2 word phrases to communicate frequently, and it sounds like he’s not quite there yet. He’s not exhibiting a major delay, based on what you’ve said, but there are enough concerns to warrant an eval just to be on the safe side. You don’t want to a problem to persist and grow when a few months of therapy could address any issue and get him caught up with little effort at this point compared to what it could be if you waited until he is older. Call your state’s early intervention program for an assessment to see if qualifies for therapy. Since he’s already talking, he may not be eligible since often times children must be quite delayed before receiving services, but they can refer you on to an SLP who could see him and teach you how to work with him at home. 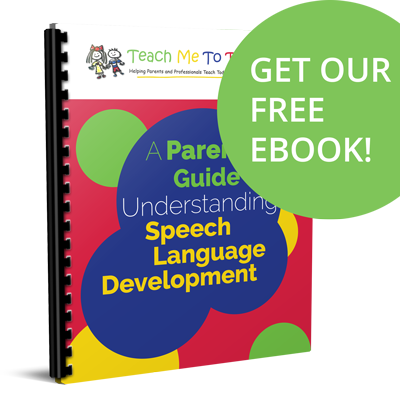 The other idea would be to take a look at my DVDs including Teach Me To Talk to work on developing his vocabulary and Teach Me To Talk with Apraxia and Phonoological Disorders to target new sounds and overall intelligibility. My pediatrician said see how he’s doing at his 2 year appt in June, but I tend to think the issue with m’s has to do with the fact that he spent the last 7 months suffering from an undiagnosed fruit and egg white allergy. During that time he was always suffering from a runny nose and had a terrible time breathing, he breathed a lot through his mouth and I wonder if he just got used to saying words that way. Before this he was able to say Ma Ma. As for phrases he does say some. He says “I did it,” “I do it,” “all done,” and sings sentences from songs. This morning he said elbow instead of elmo. He’s replacing all the m’s for b’s. I wonder if it may be an ear issue? Is there a way to test that first before therapy. I have to wonder with every m word-moon, more, moo, mama, milk, mouse, elmo, ect. All being replaced with b’s. Other than that he’s quite bright. He has a great memory and listens well. He’s trying to say new words everyday. Oh and he still signs. He’s been signing since he was 6 months. Does that cause and issue? Which DVD do you recommend from your collection? He’s great at repeating DVD’s that we have from baby signing. Thanks for your prompt reply. How do I go about getting him evaluated? Also I was just wondering if its normal to know other words or names of things but not knowing what to call your parents? Thanks for all of your advice on this site. I have been trying to get my 18 month old to say “mama” for about 2 months now. Now, when I say “mama” to her, she points to herself. I think she is imitating me because I point to myself when I am trying to teach her this word. I will promptly start using some of the techniques you have suggested on this site to see if I can get my little one to say “mama”. Right now she does have about 10 other words that she says consistently but I think I just expect her to have more at this age. She also uses continuous babbling when talking on the phone or talking to me. Her receptive language seems fine but do you think I should be worried with her only having about 10 true words right now? My son is 31 months. He can identify me as mama but he cannot call my attention by calling my name. If he wants to my attention, he just grab my face (when I am sitting with him). Is there are a way I can teach him to call me mama if he wants my attention? He was 1 to 3 word utterances. I tried to play the mama game for 2 weeks now, still does not have result. My son is 21 months old and does not say any words. We are working with our local early intervention office and a teacher sees him once a week. We had to start with the teacher to begin services. His hearing has been evaluated and is perfectly normal. We went for a speech evaluation and he will be starting speech therapy once the EI office approves the service. My concern is that he has zero words not even mom or dad. He will make noises and animal sounds and will consistently sign his word for more. What I am really trying to find out is WHY he can’t talk and if there is a disorder that describes his behavior. He is very social and seems to be developing fairly normally other than speech. Although he does not often maintain eye contact and it can be very difficult to pry his attention away from the things he really likes. He is capable of following directions like bring me your cup by does not always do so. Any thoughts or thingd to consider are appreciated. It is heartbreaking that he doesn’t say Mama or Dada but just as heartbreaking that he uses zero words at all. I long to hear him say any word! Hi laura! I chanced upon this website by accident. N i truly am blessed cos i was looking for other non related matter on google. And yes! With god’s grace, he wanted me to read this! My boy is 23 mths now. He used to say mama at 6mths n daddy at arnd the same age. His brother, in malay language is abang, n sister in the same language is kakak. He can call both his elder siblings in malay perfectly. Only now, he calls daddy, baba n me baba too. He is addicted to his pacifier n i know its bad… Cld that be the reason that he is havin difficulties is saying m words? Btw, im excited to try the games n ideas uve suggested. Ill get my elder kids to help me with this! Thanks! – Irda, from Singapore. I am in exactly the same situation. My 21 month old son says ‘yeah’ all day long, and doesn’t say anything else. 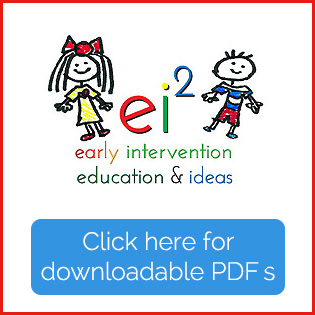 He was just evaluated by EI and shows a 25% delay in all categories except gross motor skills. I have a follow up appt with EI in 2 weeks and look forward to starting therapy. I have a hearing test scheduled for next week. What can I do with him at home in the meantime to get him to comprehend better? Jen – I can’t see your little boy, so I can’t say one way or the other what’s going on, but please know that I NEVER believe that “stubborn” is the reason a child doesn’t talk or respond during a hearing test. While we certainly do see behavioral issues in toddlers, blaming late talking, or in this case, poor responding on a hearing assessment is mislabeling the real problem – he’s not acquiring skills in the normal way we’d expect. I’m glad you’re pursuing the additional hearing assessment, likely an ABR (auditory brainstem response) testing which will defintively and objectively measure his ability to hear, and I would encourage you to follow through with that recommendation. However, many times, hearing loss is not the reason a toddler is not talking, but it should definitely be ruled out as the reason for language delay, particularly if your SLP has reason to believe it is a factor. If it does turn out that he’s hearing impaired, then you’ll be able to get him fitted for hearing aids and move on with your therapy. If it’s not, you’ll be able to cross that potential cause off your list, and again, move on with your therapy. I’m so glad that you’re working with an SLP to determine not only WHY he’s not talking yet, but to find ways to improve his ability to communicate. Just a few more questions Laura… Won’t the diagnosis make a difference in the type of therapy that is most effective for him? I guess perhaps once a diagnosis is made (or if) then we would evaluate the current therapy plan to be sure it is suited to the diagnosis? I know the therapy and things we do with him at home are going to have the biggest impact. I know your DVDs will have some signs but do you have any recommendations of a DVD I might be able to find and pick up at a retail store to use until my order arrives? Stephanie – To some degree the diagnosis does help a therapist design treatment activities but ONLY if it helps direct and explain to us to what the real deficits are. 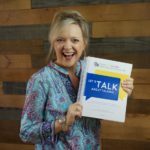 As speech-language pathologists, we don’t really treat a specific diagnosis – such as autism or Down Syndrome or even hearing loss. We target the social, receptive, expressive, or intelligibility issues a child is exhibiting, regardless of whatever label he may or may not have. When we generalize treatments according to a diagnosis without looking at a child’s very specific areas of strengths and weaknesses, we very well may miss areas that will be important to address in therapy. I don’t use lots of technology with children under 3 because I want them to be very, very socially connected to me since engagement and interaction are the foundations for establishing communication. The American Academy of Pediatrics recommends NO screen time (TV, DVDs, computer games) for children under 2 and limited amounts after 2 since babies learn to best communicate from other people, not from technology. This is particularly important for children who have even mild issues with social interaction and responding AND those with a tendency to “zone out” to all other stimuli in their environment when the TV or game is being used. Many researchers also believe that excessive “screen time” in young children wires a child’s brain to “scan and shift” making him more likely to exhibit academic issues related to attention such as ADD and ADHD. If there’s any family history of this, you’ll want to be especially careful since he may be genetically vulnerable to these kinds of issues. Check out Dr. Jill Stamm’s book Bright From the Start for more information about this. hi laura my son is 12 months old and he started saying mama around 7 months then started saying dada around 8 now thats all he will say ill try and get him to say mama, no no, baba and all he says is dada what should i do??? It worked! He calls me Mommy now!!!!! It took him til 22 months and 2 days, (one week ago, at exactly 6:42am, in case you are wondering…) but now he knows my name is Mommy! I am 100% convinced that it was because of this website helping me learn how to help him! Thank you so, very very much. Dear Laura, My 38 month old son is diagnosed to have ASD. He is social, happy, high tempered and has strong interests/will. I have got him talk a little (1-3 word sentences), expressing and sharing joy, pointing, imitating, following direction, pretend play (a little) .. all with your help. We bought the DVD’s, read your articles and picking up a new verb had become easy. Thank you so much for being such an angel. However he did not learn to say ‘mama’ despite the mama game played by his dad. He would call ‘mama’ when the game is going on, but in other situations when he wants me, he would try to attract my attention by pulling my skirt! He knows who ‘mama’ is and points at me saying ‘this is mama’! He was greatly confused about this word as well, he thought its a verb like ‘carry me’, then he called me ‘sweetie’ for few months, then he called me ‘teacher’!! He can identify his father, grandparents, teachers, uncles and cousins by their names but never seen calling them out! Also he is ‘stuck’ at his language skills, learning conceptual words very slowly (due to poor attention span) so a variety of words are missing. He uses sentences which are commonly spoken by us, or make a new sentence by adding one different word like ‘I want ___’, ‘__finished’, ‘eat__’, ‘look! __’ etc . Please help or guide me to a suitable resource. Going to an SLP is possible, but we found your therapy was much more effective! I I turned to you for help. In case you are wondering, let me say your suggestions worked for my son when my son was 21 months old! He called ‘mama’ and ‘papa’ for about a month and our therapist was glad. Then he forgot those words or got into confusions, then stopped calling us till 38 months! He can learn new things and skills, for example he is stacking 10 blocks or assembling 15 to 30 piece puzzles. His main problem is receptive speech. Could you please tell me what is wrong? Did we hurry up or taught him in a wrong manner leading to scattering of skills? He simply does not get the concept of ‘calling’ somebody! Dear Laura! Your trick finally worked! All we did is to tweak it for our tough child. In a closed room his father made him sit in ‘padmasana’ (a yoga posture) and held his legs tightly. I was waiting in other room. As he was uncomfortable sitting cross legged, he wanted to get out, his father suggested him to call mama, (or even called me). Then I came in to ‘rescue’ my son, by rolling eyes and reprimanding his father for ‘paining’ my darling! His father also acted scared and leave him at once. He enjoyed it so much that he started calling ‘mama’ just to try. Now he calls ‘mama’ and even ‘papa’ at all situations. I am so thankful to you for sharing this great strategy. I am sure many people would benefit from this strategy. Hello Laura! I’ve stumbled across your website and I am really hoping you can give me some advice! My son is 16 months old, and not saying Mama. 🙁 And our pediatrician says his language skills are pretty advanced, (about 40 words and a few 2-3 word phrases “go-go-ride” “get out” “go outside” “see that” and he has also started attaching names at the end of waving and saying bye. I was told that is closer to that of a 2 year old and after reading through the comments before mine it does seem like he is pretty advanced… so I don’t know what to think of it! For one thing, he says Dada ALL the time, but it’s not Dada, it’s Gaga. He has a lovey (a frog) the he calls Gee. And he has pointed at me in pictures before and said “Gee! !” lol I’ve been told that he may not understand yet that he and I are separate people.. and I’ve also thought that maybe “Gee” basically meant his comfort zone. He says a lot of G words, it’s his favorite consonant for sure. He says the word “good” with perfect diction though, so he can make a D sound. And he also says Moo-Moo perfectly, and he used to babble Mamamamama all the time! He looks at me when asked where’s mommy., so he knows that’s who I am. Another thing is that he likes to say the last syllable for words. So in my list of words he says, most of them are pronounced with the last syllable unless I spell them out otherwise. He can also mimic every vowel when I sing the phonics song to him… but okay Maybe this brief list will give ou some insight into his capabilities: wah-wah (water), wuh-wuh (wheel), moo-moo, cah (car), kedy (kitty), cool (motorcycle), oolehoo (cereal), Ca-ca (chicken), ick (stick), ishes (fishes), shhh, sish (swish), guhleegu (spatula), ilk (milk), iggy (piggy), ucky (ducky)… so basically he says a lot of L, S, K, and G and hardly any M, P, B… which I thought were easier for toddlers to say. So I’m at a loss. He follows instructions like a champ and he and I can have nearly fluid conversations (only I can understand his tonation and pronunciation most of the time) But he says so much! Just not Mama, and not Dada, but Gaga instead. Any clue as to what might be going on – if anything? Thanks so much! !